The head of Valve says his company is working to develop for Linux, calling Microsoft's Windows 8 a "catastrophe" that will lead product manufacturers to abandon the platform. At a gaming event in Seattle last night, as reported by AllThingsD, Valve CEO Gabe Newell said the one thing holding back Linux is video game support. "The big problem that is holding back Linux is games. People don't realize how critical games are in driving consumer purchasing behavior," Newell said, according to AllThingsD. "We want to make it as easy as possible for the 2,500 games on Steam to run on Linux as well. It's a hedging strategy. 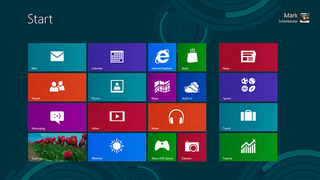 I think Windows 8 is a catastrophe for everyone in the PC space. I think we'll lose some of the top-tier PC/OEMs, who will exit the market. I think margins will be destroyed for a bunch of people. If that's true, then it will be good to have alternatives to hedge against that eventuality." Earlier this year, Stardock CEO Brad Wardell wrote an article for Kotaku about Windows 8's issues. Wardell called the new operating system a "usability nightmare." If other PC developers feel similarly, perhaps they'd be more than willing to follow Newell's lead to the Linux platform. Newell also talked about touchscreens, calling them "short-term" and saying he thinks the future of interaction will be through computerized wristbands. "We think touch is short-term," he said. "The mouse and keyboard were stable for 25 years, but I think touch will be stable for 10 years. Post-touch will be stable for a really long time, longer than 25 years. "There's some crazy speculative stuff. This is super nerdy, and you can tease us years from now, but as it turns out, your tongue is one of the best mechanical systems to your brain, but it's disconcerting to have the person sitting next you go blah, blah, blah, blah... I don't think tongue input will happen, but I do think we will have bands on our wrists, and you'll be doing something with your hands, which are really expressive." Perhaps we'll be using them to make Steam hats. According to Newell, there's a guy in Kansas making virtual hats for $150,000 a year. $150,000 a year. Anyone else want to get into the hat-making business?